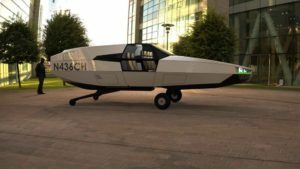 Israel’s Urban Aeronautics (UA) has announced it’s going into full-scale development of its CityHawk VTOL flying car. The first manned flights of this hybrid-powered, 170 mph six-seater will take place in 2021-22, after which it’ll be converted to run on hydrogen fuel cells. Unlike many flying car designs we’ve seen in recent years, the CityHawk doesn’t use any kind of winged flight option to help increase its efficiency over a longer range. Instead, it’s lifted full-time by a large pair of contra-rotating props at the front and rear of the vehicle, which will initially be powered by a pair of 1,000-horsepower turboshaft engines. These engines are also connected to electric generators, which charge up batteries to power twin thruster props on the back for forward motion. The configuration is similar to the unmanned Cormorant/AirMule aircraft that UA has been testing for a number of years now. That airframe has completed more than 250 test flights to date.